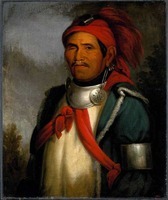 ABISHABIS (Small Eyes), Cree religious leader; d. 30 Aug. 1843 at Severn House (Fort Severn, Ont.). In 1842 and 1843 a powerful religious movement spread rapidly among the Cree Indians between Fort Churchill (Man.) and the Moose River (Ont.). The meteoric rise and downfall of its principal prophet, Abishabis, are traceable in some detail in contemporary Hudson’s Bay Company post journals and correspondence and in the records of George Barnley, Methodist missionary at Moose Factory. On 6 Oct. 1842 Barnley at Moose Factory also encountered manifestations of religious excitement, this time linked explicitly with the activities of Evans. Two visiting Indians from Severn asked him to “decypher a piece of writing the work of an Indian . . . and the characters employed those of the Rev J Evans’ invention.” Unfamiliar at the time with Evans’s new syllabic writing system, Barnley failed, and thus may have enhanced the influence of those Crees who did grasp it. He later recorded how Abishabis and his associates elaborated their symbolic repertoire further with other texts and charts, and pictographs on wood. In July 1843 Abishabis, alienated and desperate, murdered an Indian family in the York Factory area and stole their goods, evidently to support himself on a trip to his home district of Severn. He reached Severn House on 9 August and was put in irons three days later by John Cromartie; the local Indians, knowing of his crime, were “making Complaints that he was threatning them if they Did not Comply with his Requests in Giving him food &c and in fact they was afraid to leave Place while he was hear.” On 13 August he was allowed to escape, Cromartie hoping that he would “Leave the quarter when liberatted.” He left but briefly; on 28 August he was in custody again. On 30 August, three of his countrymen resolved to mete out their own justice to him; they dragged him from confinement, knocked his brains out with an axe, and burned the body on a nearby island, “to secure themselves against being haunted by a ‘windigo’” (a cannibalistic spirit associated with dangerous human beings). In the Albany area his movement retained adherents through much of the next winter, especially among inland Indians unaware of his death. Thomas Corcoran, in charge at Albany, warned his colleagues at Moose Factory and Martin Falls (Ont.) to watch for its appearance and he complained to Governor Sir George Simpson* of its effects on his trade. Assured by Hargrave that the death of Abishabis had “entirely tranquilized the ferment” in the north, Simpson advised Corcoran that he now saw little cause for concern. The movement was not forgotten, however, among the Crees. In February 1844, after an absence from Moose, Barnley returned to find the Indians under its “pernicious influence.” In August he heard that “The Severn system of folly and falsehood” was spreading among the Crees of the Eastmain (Que.). At Norway House, in the winter of 1847–48, the Reverend William Mason encountered a Cree, James Nanoo, who described himself as a minister ordained in the new faith. But Indian awareness of both HBC and missionary disapproval of the movement seems to have led most adherents to conceal their creative synthesis of Cree and Christian religion, and further written references are scarce. In the 1930s, however, anthropologist John Montgomery Cooper found that his Moose Factory informants had vivid oral traditions about the movement. Its expressed meaning, though, had been modified. They recollected nothing about Barnley, first missionary at Moose, except his surname and credited Abishabis and his associates with introducing them to Christianity. PAC, MG 19, A21, James Hargrave corr., Robert Harding to Hargrave, 23 June 1843; MG 24, J40 (mfm.). PAM, HBCA, B.3/a/148: f.22; 149: f.30; B.3/b/70: 9–10, 19, 27, 45; B.42/a/177: ff.3, 6, 17; B.198/a/84: ff.9–10, 13; 85: ff.5–6, 8, 13; B.239/a/157: f.50; 163: f.4; D.5/9: ff.308–9. SOAS, Methodist Missionary Soc. Arch., Wesleyan Methodist Missionary Soc., corr., Canada, William Mason, “Extracts from my journal,” 1847–48 (mfm. at UCC-C). UWOL, Regional Coll., James Evans papers. J. S. H. Brown, “The track to heaven: the Hudson’s Bay Cree religious movement of 1842–1843,” Papers of the thirteenth Algonquian conference, ed. William Cowan (Ottawa, 1982), 53–63. J. S. Long, “‘Shaganash’: early Protestant missionaries and the adoption of Christianity by the Western James Bay Cree, 1840–1893” S.C. ed. thesis, Univ. of Toronto, 1986). J. M. Cooper, “The Northern Algonquian Supreme Being,” Primitive Man (Washington), 6 (1933): 41–111. N. J. Williamson, “Abishabis the Cree,” Studies in Religion (Waterloo, Ont. ), 9 (1980): 217–41. Jennifer S. H. Brown, “ABISHABIS,” in Dictionary of Canadian Biography, vol. 7, University of Toronto/Université Laval, 2003–, accessed April 22, 2019, http://www.biographi.ca/en/bio/abishabis_7E.html.